You know what we just can't get enough of? Google Now cards. 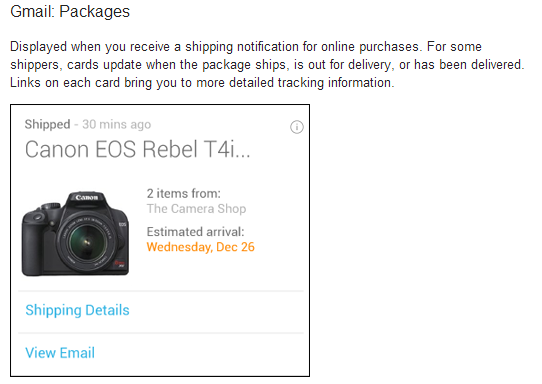 Today, the data giant updated its search app with a new real-time package tracking card (as opposed to the static "Your order has shipped" option before). In addition, regular old search results should be faster, which users on older devices are likely to love. As a bonus, the app now provides quicker access to feedback and settings on the cards themselves. All in all, this is a fairly small update, but the bump from the nice but mostly useless package tracking card from before to proper real-time tracking is a great benefit. The update is live on the Play Store now, or you can grab it from the widget below. Follow Android Police (And Your Favorite Writers) On Facebook, Google+, Twitter, And Now App.Net!